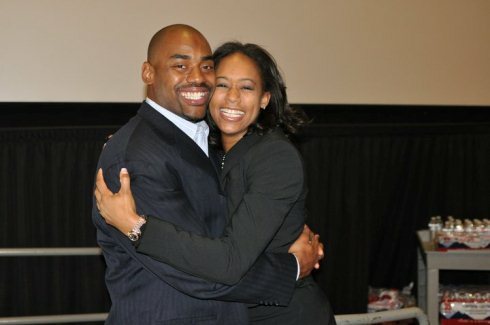 NFL Ambassador Chris Draft is raising lung cancer awareness. Their Story. Your Commitment. Our Fight. Chris and Keasha were married, and like most couples on their wedding day, they made a commitment to each other--a commitment to that each would love, honor and cherish the other. But they also made a broader commitment to all those who, like Keasha, were battling lung cancer--a commitment to tackle the disease. You see, it was on that day, standing side-by-side, that Chris and Keasha launched Team Draft. And while Keasha may no longer be physically with us, her fight and her spirit live on through our National Campaign to Change the Face of Lung Cancer. Thanks to the generous support and donations of people like you, we have been able to accomplish a lot in a year. In the last month alone, for example, we led a national initiative to offer potentially life-saving lung cancer screenings to veterans across the country in honor of Veterans Day, we joined CNN for an in-depth look at that state of lung cancer in America, which featured the stories of some of the survivors and doctors we have met along the campaign trail, and we worked with teams across the NFL to arrange to have a lung cancer survivor at every home game during Week 11 of the season in honor of Lung Cancer Awareness month. Over the last year, our National Campaign has also taken us to more than 50 of the top cancer treatment and research facilities in North America. But there is a lot more to be done, and we need your help. Keasha knew that it takes a team to tackle cancer. She also understood the dedication and commitment it would take to change the face of lung cancer. So, on her wedding day, she told her guests that she didn't want presents. Instead, she asked them to make a donation to Team Draft to support the commitment she and Chris made that day to all of those fighting the disease. Please help us celebrate Team Draft's one year anniversary by making a donation today. Your donation will ensure that we can continue to honor Keasha's commitment by raising lung cancer awareness, increasing badly needed research funding by shattering the misconception that lung cancer is a smokers disease and celebrating all those survivors who are living longer and living stronger every day. Please share our story and the video of Chris and Keasha's wedding with your friends and family, but please share the commitment to tackle lung cancer with them as well. It takes a TEAM to tackle lung cancer!